Symptom 1. Strip chart showing "Highlight has no data"
After clicking the location tile containing the switch, if the Switch strip chart shows "Highlight has no data for this period" it may be because no Critical ports have been selected. Click on the strip chart to reveal if this is the case. 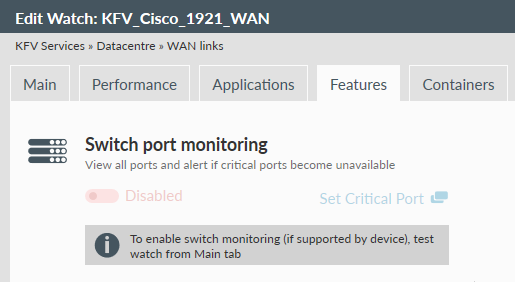 Follow the guidance for enabling critical ports. Symptom 2. 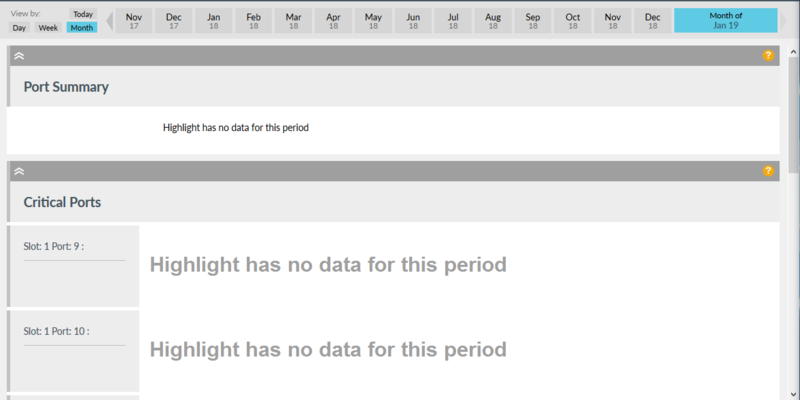 Strip chart and Details showing "Highlight has no data"
After clicking the Switch strip chart, if the Details page shows "Highlight has no data for this period" for both Port Summary and Critical Ports, it is likely to be because Highlight does not currently support switches with greater than 255 ports. There is no current solution or workaround. However please contact us to let us know you have experienced this symptom. If the entry for Switch port monitoring is greyed out in the Edit Watch: Features tab, try going to the Main tab and techtest. If the techtest reports "Identified Switch Device" return to the Features tab to Enable Switch port monitoring.